Alabama's photo voter I.D. law requires a DMV-issued photo I.D. Some 250,000 Alabamians do not have that I.D., predominantly African-Americans. 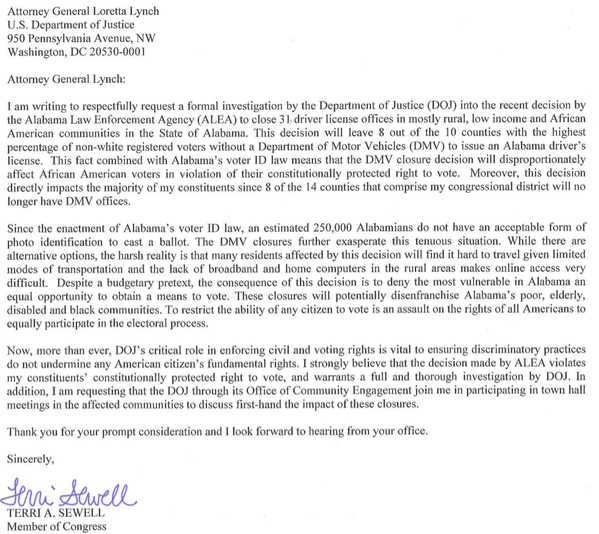 Alabama just closed 31 DMV offices, most of them in counties with a preponderance of African-Americans. The NC legislature's already started online renewal of driver's licenses. Closing of DMV offices to save a few bucks (and not for voter suppression! We swear) probably won't be far behind. All these GOP asshats exchange notes across state lines on what they'll try screwing up next. I have been curious as to the determination that a power bill was valid identification. My power bill has only on name, mine. Other members of my family, that are of voting age, presumably cannot use this as id. Go figure. Democratus....in most households "other" would be wife and kids....both of which tend to skew Democrat. As for online renewal of licenses....I thought the whole point was to keep undocumented immigrants and terrorists from obtaining licenses. Online can be anybody applying. Then there's the whole thing about rural and minority access to broadband to be able to do that sort of thing online. I'm feeling like the girl in The Exorcist!